could you please tell me what audio interfaces work for you on iOS devices and what features could be used at the same time? MIDI? Analog? ADAT? S/PDIF? WC? After solving a power issue for a PreSonus AudioBox 1818 VSL, all audio channels are shown, but there's no sound on any of the 18 outputs. I believe the 1818VSL works (it was after all used with the original iPad 1 and the original Auria to produce the original Auria demo song). It may need a powered hub to operate, but that should be about it AFAIK. I could be wrong though. Do you know if you can use the iconnect USB cable with a regular interface Derek? Seems to me this had some extra things going on inside of it. 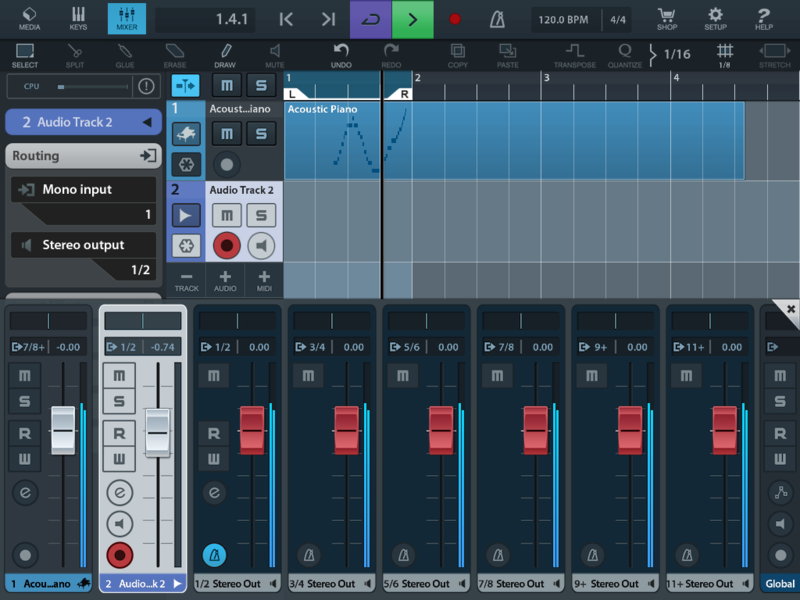 Behringer x32s work with iOS as many-channel interface. I have an X32 Producer and it works perfectly. IConnectAudio4+ works well, but is only 4in/4out. Has an iOS app that includes most functionality for configuring directly from your iDevice. Has analog, MIDI, and can connect to multiple devices via USB. I subscribed to the Auria forum. My dealer sells the Agogee One for less than the PreSonus, so the costs would be no concern, unfortunately I need digital I/Os. For high quality analog recordings I could use my Linux PC's RME card or ADAT gear. The iPad's audio card should provide ADAT with WC and MIDI or at least S/PDIF and MIDI. I want to be able to connect the iPad to a Linux DAW by digital I/Os. A headphone amp would be nice, too. JFTR I use a CCK adapter connected to a powered USB hub and the active USB hub is connected to the PreSonus. Without the hub I get the message "Cannot use Device AudioBox 1818VSL : The connected device requires too much power.". When using the hub all 8 analog + all 8 ADAT + the 2 S/PDIF and the MIDI I/Os are shown, but no port, neither an audio, or a MIDI port works. There's also no option to chose the sync source. FWIW at least all 18 outputs work with Linux. Since the device is class compliant most likely everything works with Linux, but I only tested all audio output channels. That recording didn't work was a user error, I didn't care about the line level. Recording a track works. MIDI in and out works, too, this most likely was another user error. Audio out still doesn't work. if you have Adat, you don't need wordclock - you can sync via the optical signal. It's a common misunderstanding that wordclock is 'better'. (probably because it's more expensive, but in fact mostly the opposite is the case - cable and proper termination of the network are very important, daisy chaining spoils the party. You only need wordclock to sync converters of if there's no dedicated digital IO. The used cable is a Sommer cable and I'm terminating WC with a 75 Ohm resistor, no daisy chain at all. I even use ADAT without WC, but actually ADAT isn't known as the best possible sync source, so assuming WC should be available, I'll use it. I posted a request to the Auria forum http://auriaapp.com/forum/viewtopic.php?f=21&t=14932 . For my needs it wouldn't be handy to have an audio interface and a microphone in one. The audio quality of the integrated microphone might be good or not good, it's just not a concept that fits my taste. Not sure what your use case is but I have two Focusrite 18i20;s with ADAT cross-connected between them, and the one set to external ADAT clock also feeding S/PDIF into the master, which itself is feeding my Amp via S/PDIF. Makes use of the in-box monitor mixers to reflect inputs 1-8 over to ADAT outputs for the other box so both see the same set of 16 sources and can output to any of the corresponding 16 outputs. USB to iPad Pro flawless, no hub required. Also both are feeding my DIN MIDI network for access to the vintage synths in my rack, and many controllers coming in both that way and via a USB hub. So yes, all singing all dancing certainly works. Really strange the Presonus gives the power error. It is mains powered so that should not happen. But my setup could not use the Presonus for lack of in-box monitor mixes. @Unknown_Crewman , I think "which different ios interface" is likely to lead to results just as unhelpful as you have had up to now. "When my interface is connected and all my apps set up, why do I keep hearing nothing?" When you start feeding audio signal, do you see activity in the level meter on your interface AND in the MusicStudio track? If not, get them both working, first your interface, then MusicStudio. Is your MusicStudio track input listening to the same channel input number as the one your mic is plugged into? If not, change the track listening channel input number to make it and the mic input channel numbers match. In MusicStudio, do you have "Monitor" or "Monitoring" set to "On"? If not, try connecting some. Have you checked each of your cables to ensure all of them are working properly? After you try all that, if you still hear nothing, come back and we can try more stuff. What are your opinion here on the integrated mic on the Apogee One taking from? Do you have or had this device? Or, is this just a guess? I'm not alone that this microphone is capable of really nice recordings of voices and acoustic guitars! If I use MiMix for the output matrix I only see output for the channels 1 and 2, for channels 3 to 18 there's no output. 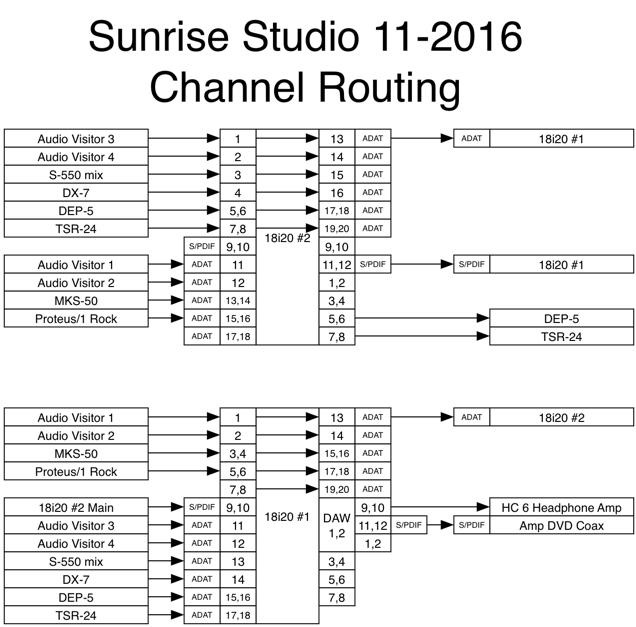 If I use Cubasis for the output matrix I see output for all channels, however, there's no audible output on any channel. Sure, all cables are tested and working when connected to Linux. There's no output signal for any channel, including the headphone output, when connected to the iPad. Yes, the powered USB hub is no issue at all, since input and MIDI ports of the PreSonus could be used with the iPad, just the audio output channels don't work. FWIW the PreSonus has it's own power supply, too, this has absolutely nothing to do with the reason why an active hub is required. The PreSonus simply needs more current than iOS allows to use, this could happen, even for devices that come with their own power supply. This is exactly the setup that works with Linux, but doesn't work with iOS. I checked the setings of the PreSonus using the proprietary software for Windows XP, too, but couldn't notice fishy settings. The used Focusrite 18i20, is it a first or second generation Focusrite? I decided against the Focusrite, since all Linux users I asked were using a first generation Focusrite, but in Germany they only sell second generation devices. Note, I want that the device works with Linux as well as with iPad, even while I only need the device for the iPad, since my Linux PC still does use a RME sound card. @Unknown_Crewman , Your setup looks full of elements, any one of which can kill the signal before it reaches its destination. Are you trying to record a live performance in front of an audience? If not, would you consider recording direct from the interface to MusicStudio, and once you get that working, add app elements one at a time til you find the problem? For me personally, I would avoid such complex setups for recording, doing each instrument singly one at a time until it's all recorded, and then mix with fx etc. To me, your complex multi-everything setup looks just too likely to fail. I recommend recording elements singly with signal chain as tiny as possible. If you must record all that at once at a live audience performance, instead of just one huge maze of a signal chain, I'd prefer multiple recording setups with multiple capture devices. A synth app is audible by the iPad's speaker, if the PreSonus isn't connected. How can I hear this synth app, by the PreSounus, if the PreSonus is connected? Recording audio works. I can plug in a synth into the anlog line ins of the PreSonus and record the audio signal with the iPad. I don't want to record any audio at all. I don't need all audio outputs, but for testing purpose I connected all outputs. The setup shown by the diagram isn't broken, it works with Linux. Connecting the PreSonus with Linux and keeping all other connections as they are, nothing fails. FWIW it doesn't matter if I only connect one output at a time, this also doesn't work with the iPad. I don't understand what is complex by this setup. I connected audio out of the audio interface with audio in of an analog mixing console. 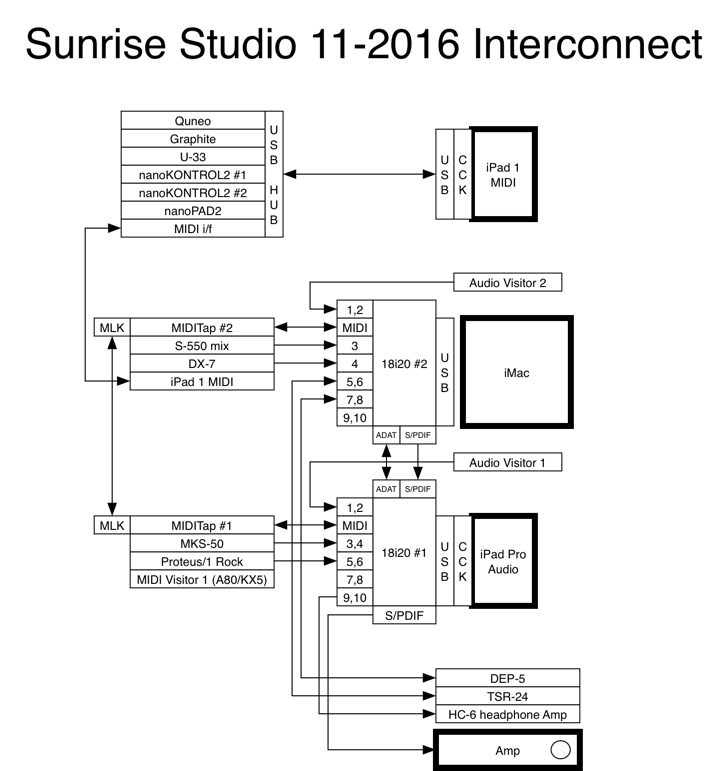 ADAT and S/PDIF can't be directly connected to an anlog mixing console. If I should have made a user error or assuming cables should be broken, it wouldn't work, if I connect the PreSonus with the Linux PC. FWIW this is just a setup for testing purpose. I do not use the Behringer gear for audio work and I won't use the analog domain of the PreSonus. The pro-sumer analog domain of the PreSonus is irrelevant for me. I've got professional gear for the anlog domain. Why do you want to do that signal chain? What purpose is it for? Please, let us not become off-topic. This setup allows for example to use the iPad as an external synth. Assuming I make a song using Ardour as the DAW on Linux, I might play and record my Oberheim Matrix-1000. A real world analog synth, with real world CEM Curtis chips. If so, I would record it by an analog input of a RME audio card. If I want to play and record a virtual synth from the iPad, I want to connect a digital output to one of my Linux PC's RME audio card's digital inputs. I don't want any workaround with recording on another device, exporting and importing audio files. Either I don't want to get some network working between the iPad and the Linux PC, since I want to be able to connect analog and digital IOs between what ever gear I might use, not necessarily always the Linux PC. IOW I want digital outputs, because I want to use the iPad's virtual synth in the same way I'm using real synth and other instruments. Actually I can't hear any output, neither an anlog, nor a digital output. I'll make a few screenshots and post the links, just in case I should miss a mute button or something like this. I use a berhinger umc204hd and it does the job. 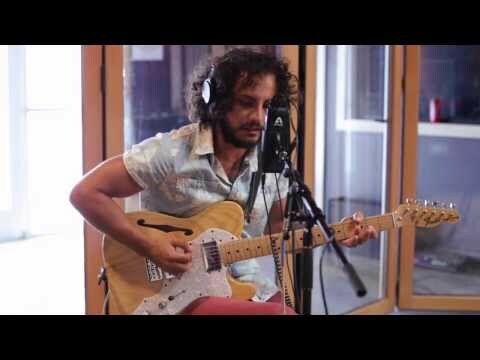 The instrument is audible, using MiMix without the PreSonus. 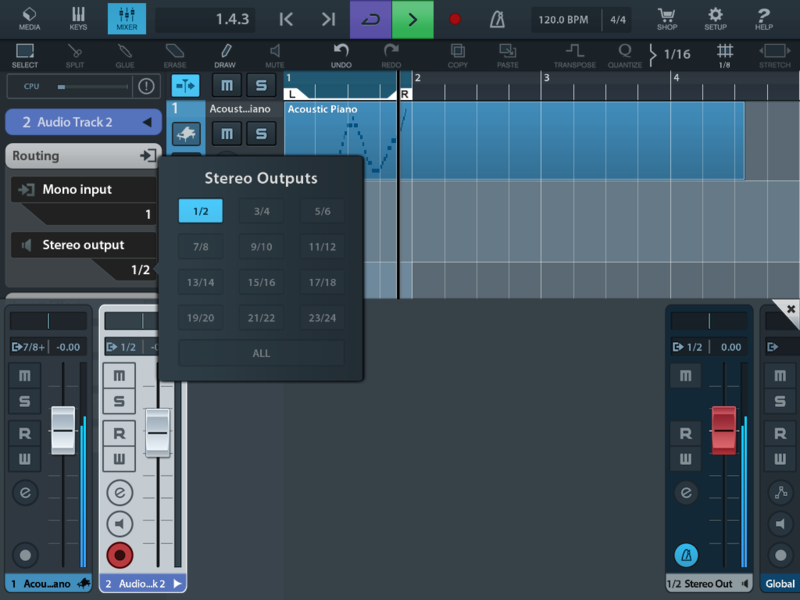 The instrument isn't audible, using MiMix with the Presonus connected, routed to channels 1 and 2. 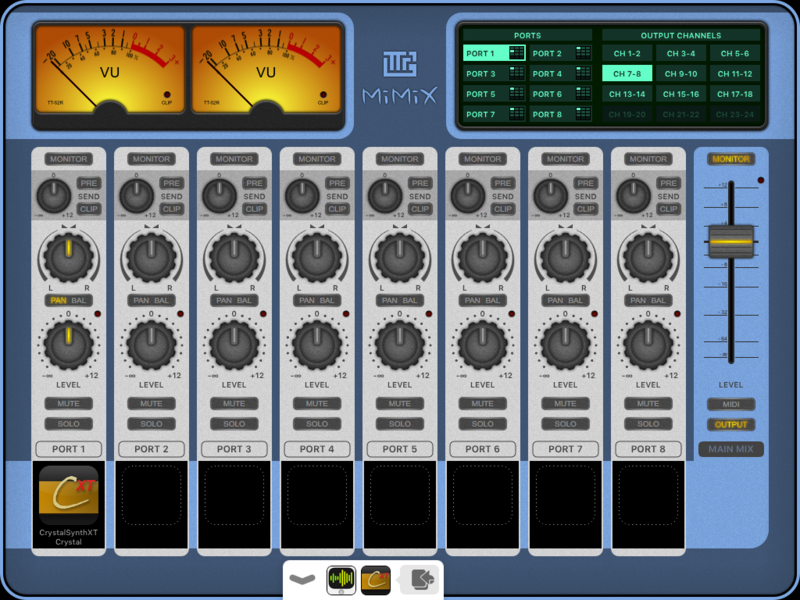 The instrument isn't audible, using MiMix with the Presonus connected, routed to channels 7 and 8 and even the meters don't show an audio signal. The instrument is audible, using Cubasis without the Presonus. The instrument isn't audible using Cubasis with the Presonus connected, routed to channels 1 and 2. The instrument isn't audible using Cubasis with the presonus connected, routed to channels 7 and 8. Cubasis was used without launching Audiobus. The cabels etc. are ok, if I disconnect the iPad and connect the Linux PC, there is audio on all 18 channels, using the same cables, digital gear and analog mixing console settings. Before connecting the Presonus I closed all apps and when it was connected I launched all apps again. Audio inputs and MIDI in and out are working, just the outputs are silent. Actually, your reasons for doing this are precisely on topic. So far I have learnt that your goal is to use your iPad as a synth and you want to route that audio to an external mixer or something? Is that right? Have you tried using any of those midi or audio over usb routing utilities? If that doesn't work, have you tried routing the synth audio from your headphone socket into your externsl mixer as a line-in? And as a last resort, have you tried any of those midi-Link signal converting utilities snd routing it that way? As already pointed out, it's off-topic. I want real audio outputs, that could be connected to studio gear. Professional grade analog outputs are too expensive and there would be no benefit over digital outputs. Crappy analog outputs don't fit to my needs. Network solutions are much too fussy. I need something that I have available by my home studio and that is also available by other studios. Of the standards available by other studios, my home studio provides ADAT, AES/EBU and S/PDIF. If I shouldn't get a digital output working, I would need a professional analog output or at least a very good pro-sumer analog output. IOW I either need to get the Presonus working or I send it back and test another audio interface. Understood. Same rules apply, though, with regard to sending signals to either the ADAT or S/PDIF outputs of an audio interface. My Focusrite has 6 outputs: 4 analog and 2 digital (S/PDIF). Within the Scarlett MixControl software, I can create a mix from any combination of the analog inputs or DAW outputs to any of the interface outputs. If I want my DAW output -- in this case, digital output from the iPad -- to be piped to the S/PDIF output, I have to enable this in the MixControl software. I'm assuming that the PreSonus has similar configurability and you need to tell it to send DAW channels 1-8 to the 8 ADAT outputs. the Presonus cannot store hardware monitor routing. You need to use it with a Mac or Windows PC and as soon as you quit the VSL software, it's just a class compliant device with no hardware monitoring at all. Apart from this, all outputs work with my Linux PC. For the Linux PC there's no VSL software available. Assuming the Presonus could store any hardware settings for class compliant usage, it would affect the usage when connected to the Linux PC, too. The reason that it doesn't work is either an user error or an iPad issue. If I connect the USB cable that is connected to the iPad's CCK adapter to the Linux PC and keep anything else as is, the Presonus outputs work. For Linux it's the same as for the iPad, there's neither proprietary software available, nor a reverse engineered driver. Linux does use the Presonus as a class compliant device, without access to the VSL features. I have been earning my living as a live /recording studio musician and audio recording specialist for over 30 years. So it's possible I might know something which can help you get the outcome you want. I freely accept that I may well be an idiot because as I see it, you dismiss as off topic any question not related to needing a new interface, and this makes no sense to me. Much of what you say makes no sense to me. Maybe somebody smarter than me with more knowledge than me can figure this out for you. However, you might be interested to know that I have seen many, many, many people significantly misjudge what is and is not related to their issues. I suspect your difficulties will go on much longer than necessary, unless you change your mind about working with the people who are trying to help you. I hope you manage to get the outcome you want. I don't know that interface, but as John suggests (and your own experience) it simply should work. Your setup looks very similiar to what I do with an Audient ID22 (class compliant with no IOS support) and I monitor the iPad via 2 Adat channels. I'm having some troubles with my setup(nothing fancy, just an old, discontinued 2/4 fast track pro via hub to powered CCK). In my case I have no issues with outputs 1/2 but as soon as I patch something to outs 3/4, those channels start feedback looping the incoming signal until I fully reboot the soundcard. (The loop length is determined by the buffer size). Long story short: I think iPad's audio drivers are not very effective(aka messy) at managing generic multiple outputs interfaces as long as those weren't specifically design for iOS interaction. 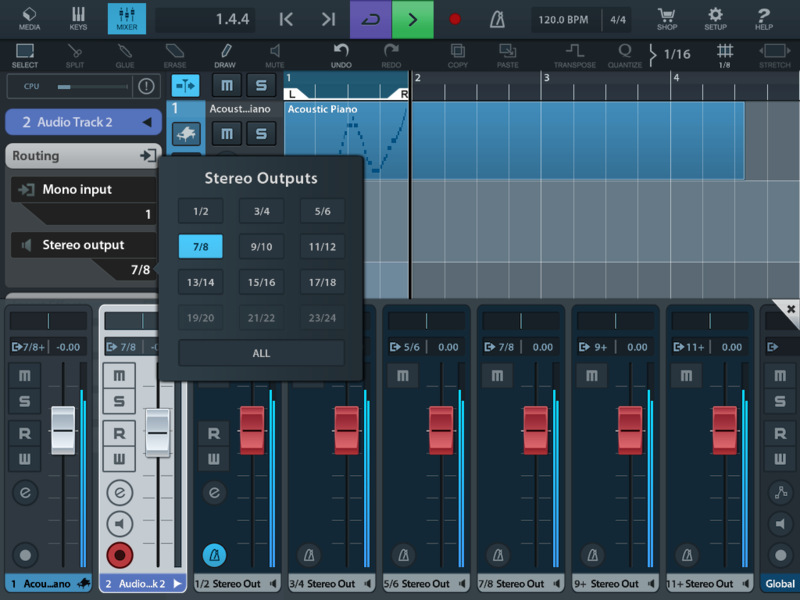 Have you checked your issues with presonus itself?